Belgian artist Hergé (Georges Remi) created the 1943 comic book of Tin Tin boy detective and his dog Snowy in The Secret of the Unicorn. Unless you are a serious comic geek most of today's sound byte iphone app obsessed young person will be completely clueless. They may be slightly intrigued by this performance captured 3D animated film with Peter Jackson's Weta digital CG is the first for Steven Spielburg. After all what was old is now new. Plus the Indiana Jones flavored adventure will keep one intrigued and entertained. John Williams score will inspire and Janusz Kaminisky's cinematography will mesmerize. Kids and adults who are not familiar with the nearly 70 year old series will quickly become fans. 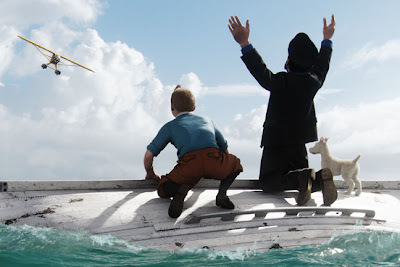 Tin Tin (voiced by Jamie Bell) with his reddish hair and trademark upswept cowlick buys a three masted sailing ship model at a European marketplace. But there are a couple of other people who are also wanting that ship. Tin Tin loves a good mystery and wants to know why everyone is so interested. Especially when his house is broken into and the ship stolen. However what they are looking for has rolled under that table when Snowy and a neighboring cat cause a ruckus. Later, Tin Tin is kidnapped and imprisoned on a ship with the ship's drunk Captain Haddock (Andy Serkis) discover there are two other model ships and also contain a parchment scroll within the ships mast. The contents of those scrolls are supposed to reveal a treasure that has Ivanovich Sakharine (Daniel Craig) is willing to do anything to attain. According to Captain Haddock his ancestor Sir Francis Haddock had to scuttle the original Unicorn over three hundred years ago by the ancestor of Red Rackham who is Sakharine's descendant. Spielburg's signature direction has created a visually dazzling adventure that is eye pleasing with good old fashioned action adventure that will qualify for the next theme park ride. The quality of the technology that powered the Polar Express has vastly improved. The animations are seamless and keep the comic characters wholesome and human without actually looking human. This medium also makes for some really exciting stunt elements enhanced by a superior 3D that wasn't added later as an afterthought or to boost the price of the movie ticket. Screenwriters Steven Moffat, Edgar Wright and Joe Cornish used plot elements from the other three books but still the story remains thin as compared to what 's on screen. Like why Tin Tin who is supposedly an adolescent lives alone, works for a newspaper, drives a motorcycle and has saved the world on a number of occasions. His fox terrier companion Snowy is just as savvy and more like a partner than sidekick. Look for Simon Pegg and Nick Frost voicing the bumbling detective team of Johnson and Johnson which add a bit of comic relief throughout the movie. With Spielburg's War Horse a favorite for Best Picture, it would a one two punch to have this film win for Best Animated at this year's Academy Awards.